I’m about to embark on my busiest month ever! 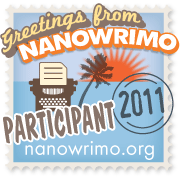 NaNoWriMo is short for National Novel Writing Month, which runs from 1-30 November every year. It’s a challenge for aspiring and professional novelists to crank out a first draft of a novel in 30 days. The goal is to write 50,000 words in November or 1,666 words a day, I think, correct me if I’m wrong. To be a winner, you have to start a new project and upload it in the last days of the contest to verify your word count. Your price for meeting the minimum 50,000 words is nothing of monetary value, but the feeling of satisfaction and accomplishment to knock out a first draft of your very own novel. In addition you get a Winner Badge for your webpage or blog and a certificate for bragging rights. Actually, I have two projects that I’m already working on. One is a German memoir about my adventures of being an Army wife (I’m about half way through my first draft). The other one is a romance novel set in a small town in Georgia. The idea for this one came when I finished reading the latest book of my favorite author, Lynn Kurland, and no other book could measure up, so I decided to just write my own. So what am I writing about during NaNo? I had this idea a few months ago to write a novel which is set in my hometown of Heidelberg, Germany, involving a ghost and an American writer helping him find a jewelry box from his time, so he can be set free. I’ve made the decision to put myself through this creative torture to prove to myself that I can actually finish a manuscript. It doesn’t have to be a perfect first draft, and I don’t expect it to. Just the thought to actually finish one is pretty cool. Editing and polishing can come later. I’ve already have a basic plot & character work that I knocked out in the last 2 days. Tonight, I’m trying to make a rough outline. Then in 2 hours, the fun begins… (12:01 a.m. November 1). Actually, I’ll be sleeping by then – hopefully, because I have to work tomorrow morning…. My netbook is charged and ready to go for some lunchtime typing. I’m so excited!!! Obviously, there won’t be many blog-posts in November due to NaNo, but I will keep you posted on my progress and stats. This entry was posted in Novel Writing, The Heidelberg Ghost and tagged Draft, NaNoWriMo, National Novel Writing Month, Novel, November, Word count, Writing. Bookmark the permalink. I am a prolific reader. Sometimes I think I should write a book. However, I am not driven to write. I think that most successful writers are driven to write. I do enjoy writing short pieces like for my blog. My motivation for doing those is to communicate an idea that most of the people I deal with on a daily basis would find boring or incomprehensible. With the blog I can pretend i am communicating (as long as I don’t review my site stats). 😀 I admire your enthusiasm. Thanks, gotta admit, though, the pace is killing me 😉 I’m 10 days out from the end of the contest – wohoo! There is light at the end of the tunnel. In December, I’ll definitely slow down and will revise my draft 1 scene at a time. No rush. I love how my story is taking shape, though. . But you know what? When I occasionally look back to what I wrote a few days ago (check on something one of my characters had said) I’m skimming through a scene to find my place I was looking for and go: “Dang, I wrote this?” I’ve been going so fast, so I’m familiar with the story, but it reads as if someone else wrote it. Wow, it’s weird. When it comes to blogging, I tend to be more erratic, sometimes I have lots to say, then at other times I just don’t know what to write about. Every time I see a new post from you pop up in my inbox, I always read it right away – no boredom there!! !